executive producers Steven Moffat and Caroline Skinner. I have to say I really liked this story for what it was. 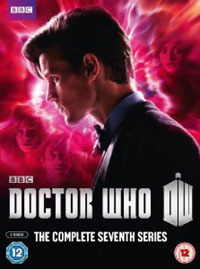 Though it plants itself on the domestic side of Amy and Rory's almost everyday Earth life, it can now get away with it so much better after all the fantastically varied settings of the previous stories. Plus, today's adventure is just so well written and full of interesting elements as well. "The Power of Three" ranks in as a good, strong average for Season 33. 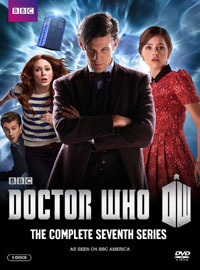 In many ways, the real premise of the tale is its attempt to integrate the Doctor into Amy and Rory's normal life, instead of having them integrate into his, which is very nicely and clearly laid out through Amy's narration in the opening sequence. It's very close in concept to season 31's "The Lodger" (story no. 216), but it succeeds so much better at the idea of domesticating the Doctor. Firstly, he can be his own open honest self the whole way through, rather than trying to pretend that he's one of us, which allows for a number of deeply heartfelt emotional scenes that can engage the truth of the characters and hit home. And secondly, we have to note that the structure of the overall script is remarkably free. Time and again we see the characters faced with a lot of options, and no real pressure to make hasty decisions. Instead, they look deep down at what they truly want, and wrestle with bigger questions of what they want their lives and lifestyles and relationships to be about. They have the time to do it here, which makes the tale feel so much larger in scope and more profound. I love it. Though writer Chris Chibnall has always been fond of time pressure and a ticking clock, he only uses those in short sequences in this tale, while the adventure in its totality is much more of an exercise in patience. Of course, the Doctor is seen to struggle with this quite a lot. Back during his exile days in the Jon Pertwee years, he might easily have taken all this in stride, but his pace of life has been so frenetic of late, he finds it difficult to get back into that more relaxed mode. As a bonus, we get to see him squeeze a few mostly off-screen mini-adventures into the middle of this tale, which gives us a hint of what his adventures with Amy and Rory look like to those Earthly people on a normal time scale who try to be friends with them. I love the fact that Rory's dad Brian comes back to make another appearance. We haven't had companions' extended family be this entertaining since Jackie Tyler, Mickey Smith, and Donna's grandpa Wilfred Mott. Nice. Additionally, Brian embodies the kind of patience that the Doctor is struggling to emulate, the kind that is actually of more use in real science than the Doctor's frenetic jumping about. This story rounds out Brian's character nicely and provides a great balancing perspective throughout. The story also brings back U.N.I.T., once again without any recognizable faces from stories past, which has me scratching my head somewhat. But to the story's credit, the face we do get of Kate Stewart, played by Jemma Redgrave, is one of the best we've ever got in New Millennium Who. I'll definitely say that I trust the fate of the world in her hands more than any other member of U.N.I.T. seen since 2005, and that includes Martha Jones. It is a nice nod to the fans to say that she's the daughter of Brigadier Lethbridge-Stewart, which may be the source of her calm, confident, stoic optimism. All to the good. I do hope we see her again at some point. The plot with the cubes is really just subservient to the needs of the year-long character story being told, yet it's also different enough from the usual Doctor Who plots to sabotage audience attempts to guess what it's all about or what will happen next. It reminds me a lot of the monoliths from the "2001: A Space Odyssey" series, only made more personal in a Russell T. Davies kind of way. I have to give this plot a general thumbs up. It does feel a bit contrived that one of the focal centers for this plot should become the hospital that Rory just happens to work at, but I'll let that go. Still, I think I found the hospital setting of "Smith and Jones" (story no. 183) to be more interesting. I also like the sequences on the spacecraft, along with all its visuals, and the brief glimpse we get of the Shakri. The Doctor digs through some dialogue with one of them, searching out their motivation, and we get a few telling sound-bites. But there's a distinct feeling that we are only skimming the very shallow layer on top, and that there's a whole iceberg of mysterious purpose below waiting to be discovered. What exactly is "the tally" all about? I like not knowing yet, and I hope we encounter the Shakri again doing something completely different to add to the mystery. The end of this show is exuberant and powerful and uplifting. I really like where this one has gone, and the statement it makes about this TARDIS traveling trio. In fact, I almost wish a slight re-write had allowed Amy and Rory to go out on the high of this story. Although another adventure with them, before or after this one, is certainly welcome, the one they did get left much to be desired. Read the In-depth Analysis Review for the next story: "The Angels Take Manhattan"